There is also a pdf-version of this document for printing. 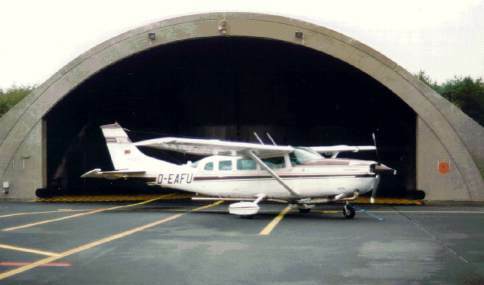 The Institute for Space Sciences of the Free University Berlin maintains a Cessna 207T as an airborne research platform which is stationed at Berlin-Tempelhof. For navigational purposes it is equipped with a Bendix King Flight Management System KNS660 with GPS, Omega, VOR and DME, a Radar altimeter and different kinds of GPS Receivers for experimental support. All relevant navigational data are recorded automatically. Usually imaging instruments are installed on top of an attitude stabilizing platform (SM2000) manufactured by Carl Zeiss to provide an unobstructed nadir view through a cabin hole (diameter: 420	mm). It compensates the roll, pitch, and yaw movements of the airplane which are measured by a gyroscope and recorded to support data processing. It is also possible to measure in zenith direction if the detector head is small enough for the holding device at the back cabin door. 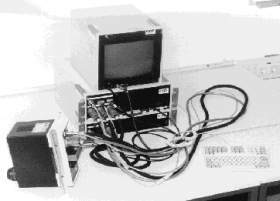 casi is a pushbroom imaging spectrograph using a CCD array as detection unit. The two dimensional array of the CCD comprises of 512 pixels perpendicular to the flight direction (spatial pixels) and of 288 spectral pixels. Depending on the operated mode the number of pixels is altered. casi is installed on the stabilized platform and measures upwelling radiances. Intensity calibration (W m-2 sr-1 (10-6 m)-1) is done with the help of an Ulbricht sphere and lamps of known spectral characteristics. Spatial resolution: depends on aircraft speed, instrument setting, and altitude, e.g. 4 by 6 m (for 511 spatial pixels, speed 100 m/s, height of 3000 m, and an integration time of 60ms). Integration time: depends on operating mode, e.g. in the order of 60 ms. 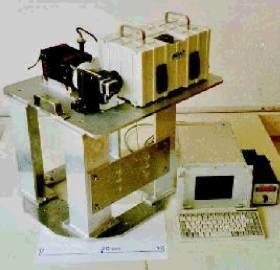 The spectrometer FUBISS measures intensities in the visible and near infrared of the solar spectrum. It is mainly based on industrial components (spectrometers: Carl Zeiss, detectors of the spectrometers: Hamamatsu, fibre optics: standard SMA connectors), and it has a great flexibility to measure irradiances or radiances with different entrance optics. During the last campaigns we used FUBISS to measure airborne zenith (back cabin door) and nadir (stabilized platform) radiances, or we modified FUBISS to become a sunphotometer. For 4D-Clouds the system will be extended to measure fluxes in nadir and zenith direction as well as radiances with different viewing directions. The calibration is done with an Ulbricht sphere and a lamp of known spectral characteristics. The calibrated results are given in (W m-2 sr-1 (10-6 m)-1). 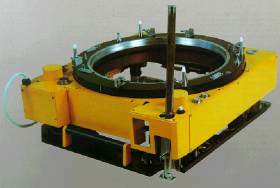 The integration time can be changed by the operator during the measurements. 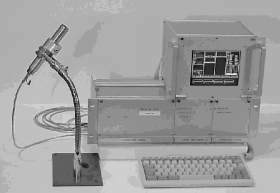 The FTIR (Fourier transform infrared) spectroradiometer measures upwelling radiances originating from the atmosphere and the Earth´s surface in the mid-infrared spectral range. Through a rotatable mirror the FTIR spectrometers (MIDAC) viewing direction can be switched to nadir or to a servo controlled high emissivity calibration blackbody. It is supported by a small aluminium bench which can be placed on the stabilized platform onboard our Cessna. The FUBISS system will be extended as mentioned before. The algorithms to derive the parameters below have been developed for a spectrometer of similar design but not for FUBISS itself. It is necessary to adjust those algorithms to FUBISS what will be done in the near future. In general it must be mentioned that most of the products can only be derived under certain conditions (e.g, optical thin clouds for the FTIR products). Thus, the Level 2 products represent the optimum of what can possibly done. The accuracy often depends on the measuring conditions (e.g., sun zenith angle). The synergetic potential of casi images and ground based measurements of LWC profiles might lead to interesting results concerning the 3D cloud structures. Especially for validation the comparison of the microphysical measurements made by the Merlin and/or the Partenavia and our derived parameters are important. The investigation of the radiation field in the vicinity of inhomogeneous clouds through spectrographic measurements above, within, and below clouds is our main objective. Radiance and irradiance measurements in at least nadir and zenith direction should be carried out. In addition flight levels as high as possible above cloud top simultaneous with a satellite overpass of MSG or ENVISAT are planned.